My favourite Subaru is back with a new set of clothes, and it's a nice new wardrobe for a vehicle that was pretty nice already. That said, Subaru continues to inflict a continuously variable transmission on its non-manual transmission vehicles and even though it's better than many it's still as whiny and annoying as I am when faced with honest work. According to the company, the Forester has been re-engineered from the ground up for 2019, including a new BOXER engine, where (like many Porsches) the cylinders are mounted "flat" rather than in a "V" or a line, so the pistons face off against each other, like boxers duking it out. There's also a new CVT Subaru says works with the new PUGILIST engine to create more power while also increasing efficiency. Consumers looking for a three row SUV/Crossover have a new choice in Subaru's latest new model. The Ascent, new for 2019 and, according to Subaru, their largest vehicle ever, is aimed straight at such vehicles as Mazda's terrific CX-9, the Honda Pilot, Toyota Highlander, VW Atlas, etc. etc. etc. etc. etc. Yep, it's a pretty crowded niche. And that's great! More choices are certainly better than fewer. The Ascent (add a couple of "S's" to the name and you surely have a decent – or de-scent – fart joke!) seats up to eight people and features all the stuff that has made Subaru popular with its loyal audience – such as symmetrical all-wheel drive that's comfortable on and off road. Alas, it also inflicts a couple of things that aren't so good – stuff such as a continuously variable transmission (though this one is far from being the most annoying CVT I've experienced) and nannies that are so annoying I found myself cussing at the vehicle repeatedly. That said, there's a lot to like about the Ascent, including a comfortable and attractive interior that's designed and built mostly logically, as well as coming with most of the more mainstream tech features found on most new vehicles these days – stuff like Bluetooth, power this and that, you name it. It's no STI - or even a WRX, but the 2015 Subaru Impreza PZEV can still be a reasonably compelling drive despite its uninteresting power plant. The PZEV moniker means it's a "partial zero emissions vehicle," and though I know they're trying to differentiate themselves from "dirtier" engines, you could say that every other car that isn't all-electric is also a "partial zero emissions vehicle" - because "partial" does not mean "is" zero emissions. In fact, Subaru describes PZEV as producing "zero evaporative emissions, offering extremely clean emissions" and making "the most of every drop of fuel" and the company claims the car can get up to 8.5 L/100 km in the city and 6.4 L/100 km on the highway, even with its all-wheel drive configuration. Love 'em or hate 'em, Subarus have earned a loyal following for their tradition of offering all wheel drive vehicles that can take you virtually anywhere at any time. And for 2015, two of the company's top models have been tweaked to make them an even better choice for those susceptible to the brand's charms. If the temperature falls in a Forester, and no one's there to feel it, does it still get cold? It's a question for the ages. Ages three to five undoubtedly – or maybe IQ's in that range – but if nothing else a unique way to get into a review of the 2014 Subaru Forester, the Japanese marque's entry into the "cute ute" segment of the market. All-wheel drive can come in a handy if you're looking for the most traction or flexibility in where you can take your vehicle – such as in snowy climes or to off-road locations. Entry Level Subaru Still "Impreza-ive"
The 2010 Subaru Impreza sports a few upgrades and enhancements designed to make it more attractive to its base of loyal customers – and others – while remaining true to its "rally-bred" roots. The Subaru Forester is a nice blend of wagon and SUV, a vehicle that's comfortable and attractive and which does its job well. Subaru's hot little WRX is back, with new clothes but the same impertinent attitude, and fans will probably be pleased. Webster's Unabridged Dictionary describes Legacy as, among other things, "anything handed down from the past, as from an ancestor or predecessor". The new schnoz is the first thing you'll notice about the 2008 Tribeca (assuming you approach it from the front!). Gone is the weird, supposedly aviation-inspired triple grille, replaced by one that looks decidedly Chrysler Pacifia-ish. It's a little bland compared to the older grille (proving that you just can't please some people), but it works. Subaru has jumped into the so-called SUV market with both feet, offering a terrific new vehicle that’s at least as nice to drive as any other SUV I’ve tried. Subaru has been marketing its Forester as an SUV for several years now, but I’ve always found it more of a tall wagon than an honest to goodness SUV. And that’s fine! I’ve always liked the Forester, and prefer it to most SUV’s; along with the old Mazda Protégé 5 it has been one of my favorite such wagons, though the Subaru has had the advantage of the company’s traditional all wheel drive. Subarus Outback Comes Back Out Front? One of Subarus "legacies" is its self proclaimed worlds first sport utility wagon, the Outback. Basically a beefed up version of the Legacy, the Outback is newly redesigned for 2005, a freshening that keeps what made earlier versions popular, but ups the styling and technology ante to reflect the current state of the art better. Id never driven a Legacy or an Outback before this review, though Ive driven most other Subarus from the past couple of years, so I was extremely interested to try this top-of-the-line 3.0R VDC model. I like Subarus, especially the Forester, but on the whole am of the opinion that they dont come off quite as refined in their feel and appointments as some of the Japanese competition Ive driven. In theory, if you take a nice vehicle and add a turbocharger to it you’ll up the driving fun ante. In practice, at least as far as the Subaru Forester is concerned, this is exactly what happened. Yippee! 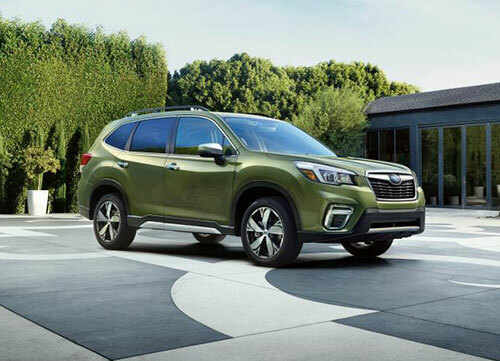 The Forester is Subaru’s SUV, though the company likes to say it has the functionality of an SUV with the driving experience of a sports car. And that isn’t a bad description, because it really does balance both tasks – though that also makes it come off as not quite master of either. Subaru thinks it has the answer for people with lifestyle toys to haul but who dont want to own an honest-to-goodness pickup truck to haul them. Its the Baja, a version of the companys Outback from which Subarus engineers have sliced the rear end, replacing the station wagon's bum with a small pickup bed. The result is an odd kind of hybrid vehicle  not in the gas/electric power plant hybrid vein but in its blend of comfortable car and utility hauler. If a tree falls on a Forester and no ones around to see it, does it still leave a dent? Undoubtedly - and I apologize for the lengths to which Ill go to make a bad joke. Fortunately, Subarus Forester SUV is no joke; rather, its a very nice vehicle to drive and is nimble enough that it may be able to avoid said tree, as well as other road hazards such as snow and the like. Subaru's entry level Impreza may be the most affordable in the company's Impreza line, but that doesn't mean it's stripped bare. The Impreza 2.5 line ranges from the TS of this review to the pocket rocket WRX. The TS doesn't feel particularly entry level, however, and its performance is more than adequate for reasonably spirited every day driving and its features are comparable to other cars in its class. Subaru's Impreza WRX is being hailed by many as a legitimate road rocket. Inspired by the marque's championship rally vehicles, the 2002 WRX' secret weapon is a turbocharged, two liter four cylinder power plant that cranks out 227 hp and 217 foot pounds of torque. The result is supposed to be a Really Fast Car - and with its five-speed manual transmission it probably is. Unfortunately, the Subaru Impreza WRX Sport Wagon I drove was hamstrung by the optional four-speed automatic transmission and, off the line, that and a case of turbo lag has turned this projectile into a bit of a brick. To be fair, once you get the revs up past 3000 or so, the afterburner kicks in and you're sent hustling with remarkable abandon. Until then, however, one is tempted to get out and push.